Summary: MR offers by far the most sensitive technique for detecting multiple sclerosis (MS) lesions and has proved to be an important paraclinical tool for diagnosing MS and monitoring therapeutic trials. Technologic advances of MR in recent years have dramatically improved our understanding of MS disease. This review will focus on the contribution of MR imaging in MS and provide a discussion of conventional and advanced nonconventional MR techniques with regard to current findings, clinical correlations, and future directions. Multiple sclerosis (MS) is considered an inflammatory autoimmune neurologic disease that is characterized by pathologic changes, including demyelination and axonal injury. The first MR images of MS were produced in the early 1980s, when MR was introduced into hospitals. The high conspicuity abnormal signal intensities of MS lesions seen on MR imaging provided the best view yet of tissue injury, lesion activity, and disease accumulation compared with all other imaging modalities, including CT. Since then, MR imaging has become a routine clinical examination in MS and is used to help the diagnosis and track the natural course of the disease. With the advent of newer quantitative MR techniques—including volumetric MR imaging, magnetization transfer imaging (MTI), diffusion tensor imaging (DTI), and proton MR (1H-MR) spectroscopy—our ability to detect and characterize the disease burden, including occult microscopic disease invisible when using conventional MR techniques, has largely improved. Today, MR imaging is the most important paraclinical tool for MS, and MR imaging–derived measures have been established as standard outcome markers to monitor the treatment response in various MS clinical trials. 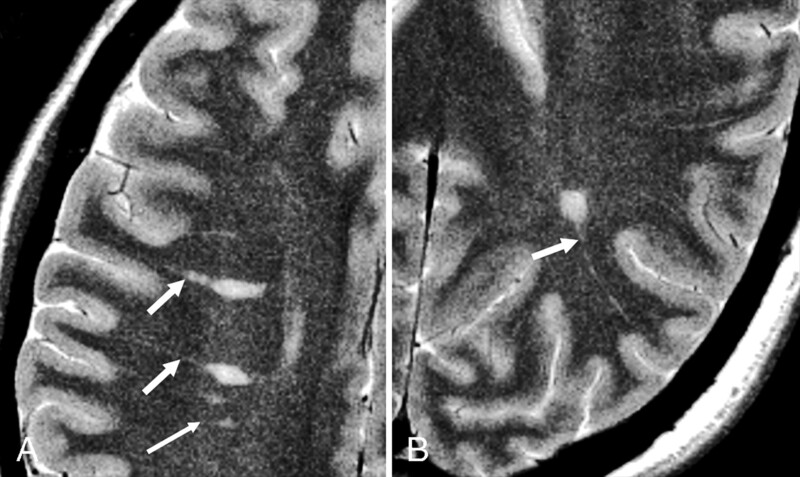 Axial T2-weighted images of a 43-year-old RRMS patient show prominent perivascular spaces (short arrows), which project radially and are aligned with lesions, following the course and configuration of deep venular structures. This may be associated with perivascular inflammation, which initiates the development of new lesions (long arrow). These prominent perivascular spaces might have implications for differentiating primary from secondary demyelinating lesions. 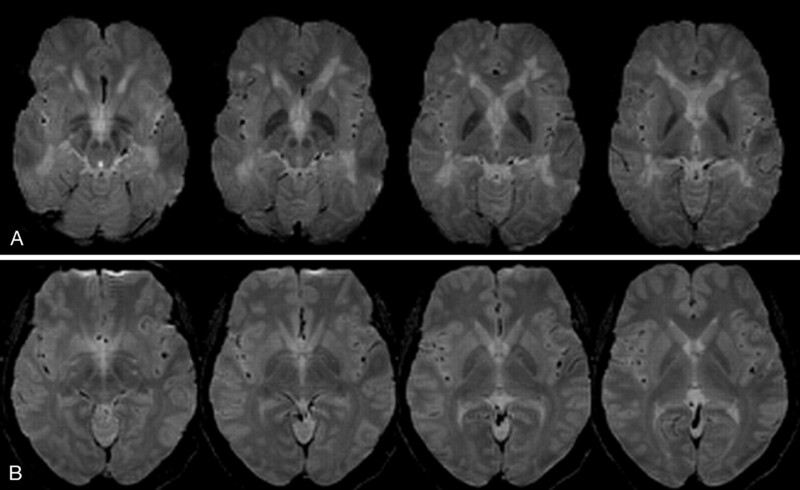 A 30-year-old female RRMS patient shown on T2WI (A), FLAIR (B), and contrast-enhanced T1WI. The lesions on FLAIR are usually prominent and several small lesions are depicted only on FLAIR (arrows). The lesion enhancement can be nodule (as shown in this case) or ringlike on T1-weighted imaging. MS lesion (arrow) in corpus callosum on FLAIR imaging is failed to be picked up on T2-weighted imaging. On T1-weighted imaging (T1WI), the acute MS lesions are often isointense to the normal white matter but can be hypointense if chronic tissue injury or severe inflammatory edema occurs. The accumulation of hypointense lesions (so-called black holes) may correlate with disease progression and disability.8 In the acute inflammatory phase, the lesion may disrupt the BBB, leading to gadolinium enhancement (Fig 2) that is believed to be the first detectable event on conventional MR imaging,9,10 and may last from days to weeks.11,12 Enhancing lesions, which may vary in shape and size; usually start as homogeneous enhancing nodules and subsequently progress to ringlike enhancements. Contrast-enhanced T1WI is now routinely used in the study of MS and provides one in vivo measure of inflammatory activity. It is able to detect disease activity 5–10 times more frequently than the clinical evaluation of relapses,13 which suggests that most of the enhancing lesions are clinically silent. In the chronic stage, lesions often appear as isointense or hypointense on T1WI and usually persist for many years on T2WI. Some patients may experience the expansion of a pre-existing lesion with or without enhancement. In recent years, MR imaging findings including the lesion number and location are included in the diagnostic criteria of MS.14 To address the role of conventional MR imaging in MS, however, several issues must be noted. First, the ability to detect lesions depends on not only the pulse sequence and imaging parameters, but also the field strength. Keiper et al found a mean of 88 more lesions on images obtained at 4T compared with images obtained at 1.5T in 15 patients with MS.15 Second, the number of enhancing lesions, which is suggestive of new lesions and inflammatory MR imaging activity, can be influenced by the dosage of the contrast agent. Studies have shown that a triple dose or 3 subsequent single doses can result in an increased number and size of enhancing lesions.16,17 Third, numerous cortical lesions have been observed on histopathologic examination,18 but they are not commonly seen on conventional MR imaging. Further work must be done to develop a better sequence that would provide optimal higher spatial resolution and contrast for these lesions. In sum, volumetric MR imaging provides an objective account of the natural history of disease progression, activity, and tissue loss in MS and provides clinicians with a valuable tool for quantifying the disease. Currently, however, studies by using such automated segmentation techniques are mainly based on programs that were developed “in-house.” A reliable, quick, and clinician-friendly technique that can be used in the routine clinical setting remains in strong demand. By using the region of interest analysis, studies found that hypointense lesions had a lower MTR than isointense lesions,54 the central portion of ring-enhancing lesions had a lower MTR than homogeneously enhancing lesions,55 and demyelinating lesions had a lower MTR than inflammatory lesions (edema).47 In addition, the perilesional MTR is lower than that of the remote region.56 The MTR in dirty-appearing white matter is lower than that of NAWM but higher than that of lesions.57 Finally, the MS lesions usually have a more reduced MTR as compared with ischemic lesions in small vessel diseases.58,59 These results suggest that MTI may increase the specificity of MR imaging in assessing the extent of demyelination or residual myelination of MS lesions. MTI can also play an important role in assessing the disease burden by applying an MTR histogram based on whole brain tissue (so-called volumetric histogram analysis) as introduced by van Buchem et al.69 The global MTR histogram allows for the evaluation of data from all pixels of the brain tissue (ie, parenchyma, gray matter, white matter), and therefore provides a more complete picture of disease burden, including the substantial occult pathology in NAWM. This is achieved by the registration and transformation of an MTR parameter map onto a segmented tissue map. The global analysis is particularly useful in assessing diseases with a diffuse nature such as MS, because such quantitative analysis can also be performed longitudinally to monitor disease progression or treatment efficacy. MTR histogram-derived measures including mean, peak position, and peak height appeared significantly different in MS patients as compared with normal controls.69–71 The characteristics of the MTR histogram also differ between the various clinical forms of MS.71,72 Several studies have found a correlation between global MTR histogram metrics and neurocognitive impairment,70,71,73 which indicates that global MTR histogram analysis is sensitive to clinical changes in neurocognitive functions. Classically, MS is defined as a white matter disease; however, evidence from both imaging and histopathologic studies increasingly shows that gray matter is not spared from the disease.74–76 Because gray matter and white matter differ both anatomically and functionally, lesions in these 2 tissues are also different regarding their imaging and histopathologic features.5,75 When measured globally, there are significant differences in the MTR histogram metrics for both normal-appearing gray matter (NAGM) and NAWM between patients and normal controls (Fig 4).24,76 The cerebral T2 lesion load tended to have a negative correlation with the MTR histogram measures for global NAGM only,24 which indicates the effects of retrograde neurodegeneration from distal white matter lesions on cortical gray matter. The MTR abnormalities in NAWM, however, may arise from a primary demyelinating process that is independent of the lesions. In addition, the changes of the MTR in normal-appearing brain tissues also differ between MS phenotypes (Fig 4)24 and show different rates of progression.73 The separate analysis of gray and white matter may allow for the improved detection of underlying subtle tissue abnormalities as well as a better understanding of the natural history of MS disease. Averaged magnetization transfer ratio histograms from 3 groups (healthy control, RRMS, and SPMS) for global NAGM (A) and NAWM (B) tissues. Lower normalized peak height in SPMS population indicates relatively less residual normal brain tissue compared with that in RRMS patients. Compared with conventional MR imaging, MTI has shown increased pathologic specificity and high sensitivity to NAWM abnormalities. Therefore, MTI offers a unique, noninvasive tool for imaging myelin disorder, remyelination process, and occult pathology in MS.
Water molecule self-diffusion, referring to the microscopic random motion in biologic tissues, provides the basis of the modern picture of diffusion-weighted imaging (DWI). When water diffusion is measured for a complex medium, the diffusion coefficient of biologic tissue is lower than that in free liquid, and hence an “apparent diffusion coefficient” (ADC) is actually measured. In tissues, such as white matter, molecular movement is not the same in all directions (so-called anisotropy) due to the structural barrier within the fiber tracts, leading to an orientation-dependent diffusion property. DTI is acquired with diffusion weighting gradients in at least 6 noncolliner directions that allows for the construction of a tensor.77 The tensor can be used to produce images of both mean diffusivity (MD) and fractional anisotropy (FA), which demonstrate voxel-by-voxel differences in the magnitude and directionality of water diffusion, respectively. Therefore, DTI may provide information about tissue microstructure and architecture including size, shape, and organization78 and in turn constitutes a proved and effective quantitative method for evaluating tissue integrity at a microscopic molecular level. In addition, the information provided by FA can also serve as the basis for fiber tractography,79 a method to determine the pathways of anatomic white matter connectivity. DTI (left, b = 0), FA (middle), and MD (right) maps of a 31-year-old female patient with RRMS. The decreased value of FA and increased value of MD for the lesions (arrows) are shown in their maps. Note that the decreased FA (arrowhead) in some white matter areas is probably due to fiber crossing. Studies of DTI in NAWM have also revealed a decreased FA and an increased MD in different regions,81 which is in agreement with findings from MTR studies and suggests the presence of subtle microstructural changes (eg, the loss of barriers) in the NAWM that are beyond the resolution of conventional MR imaging. DTI abnormalities in NAWM tend to be more severe in the periplaque regions.92 Several studies, however, did not show abnormalities of DTI indices in NAWM in early MS.93,94 One study of DTI95 showed significant water diffusion changes in the normal-appearing corpus callosum (NACC) in a group of patients with early MS; however, such significant abnormalities were not observed in other NAWM regions, which suggests a preferential occult injury of the corpus callosum in MS. The diffusion abnormalities of the corpus callosum also correlated with the cerebral lesion load,95 which is probably due to the accumulative bridging effects of the corpus callosum that result in the wallerian degenerative changes from the connecting distal white matter plaques.96 This is in agreement with a recent quantitative postmortem study97 which showed a significant reduction in axonal attenuation or the total number of axons passing through the areas of corpus callosum that grossly appeared normal in MS. In certain regions of NAWM, however, FA can be very low in the areas of fiber crossing, therefore, may not be a reliable marker for the diffusional abnormalities. By calculating the eigenvalues in different directions or by quantifying the radial diffusivity in a fiber tract region with known orientation, Song et al showed in an animal model the potential of DTI in differentiating myelin loss and axonal injury,98 which should be validated with human data, given that such detailed and accurate information of axonal preservation in demyelinating lesions is clinically relevant in understanding disease severity and guiding treatment. Recently, there has been interest in using fiber tractography obtained from DTI datasets to characterize white matter tract directionality and integrity in central nervous system (CNS) diseases. Recent experimental work105 has demonstrated that the fiber tract disruption caused by the transection of lesions can be directly visualized on fiber tractography (Fig 6). Compared with NAWM, these lesions were associated with significantly fewer fiber tracts and lower FA.106 Because MS lesions often occur in the white matter pathway, by using DTI tractography we have observed fewer fibers generated in the corticospinal tract at the brain stem level in patients with a higher cerebral lesion load than in patients with a lower lesion load.105 The observation that fiber tract loss in the corticospinal tract is associated with distal upstream lesions supports the concept of wallerian degeneration and axonal transection in MS disease.107 It should be noted, however, that, though the number of fibers can be quantified via tractography, this depends on the FA threshold and the degree of the trajectory angle provided. With continued advances and additional clinical applications, fiber tractography should play a vital role in not only the identification of tracts of interest, but also the quantification of the degree of axonal loss and demyelination within a specific white matter tract. This would improve the specificity of MR in monitoring the disease progression of motor and cognitive deficits in MS. Fiber tractography in a patient with MS (A) and a healthy volunteer (B). All the MS plaques (arrows) were marked and constructed in 3D. Note the reduced number of fibers when they traverse white matter lesions in the patient. Studies of MS lesions by using perfusion MR imaging have also shown evidence of hemodynamic abnormalities113–115 including the increased CBV in acute lesions, which suggests that microcirculation may be modulated by inflammation or acute hypoxia. In a study by Wuerfel et al,114 the altered local perfusion changes can be detected before the disruption of the BBB and new lesion formation. By detecting various lesion types, Ge et al115 found not only enhancing lesions, but also some chronic nonenhancing lesions showing increased perfusion, which may indicate lesion reactivity or renewed inflammatory changes, which are also before BBB breakdown and not visible on conventional MR imaging. These findings are important in that hemodynamic abnormality is a significant component in the pathophysiology of MS lesions. Perfusion imaging may have a predictive role of lesion reactivity and/or new lesion formation and, therefore, has the potential to predict disease activity, and monitor disease progression or the effects of therapy. The recent development of 1H-MR spectroscopy has enabled the in vivo study of certain chemical compounds or metabolites in a variety of pathologic processes that affect the CNS. As a noninvasive adjunct to MR imaging, 1H-MR spectroscopy offers potentially unique insights into the histopathology of MS. In MS lesions, the most common and remarkable finding is the reduction of the N-acetylaspartate (NAA) peak (Fig 7) compared with other metabolites. In acute active lesions, the initial reduction of NAA at the onset of lesion development can be partially restored after the acute phase on serial MR spectroscopy studies,116,117 which suggests that the decrease in the values of NAA does not necessarily imply permanent neuronal and axonal loss. The recovery of NAA may be related to the resolution of edema or neuronal dysfunction recovery. Choline (Cho) is found to be increased in the acute pathologic phase,118 which may be associated with the release of membrane compounds during active myelin breakdown, resulting in an increase of phosphocholine and glycerol-phosphocholine. In addition, a higher concentration of lactate may also be observed in the acute phase and is possibly related to the inflammatory or ischemic condition.119,120 After careful exclusion of the spectral of lipid contamination, prominent resonances presumably originating in lipids or fatty acids may also be observed in the earlier stage of the disease,121,122 indicating the breakdown of myelin and phospholipids due to active inflammation. Elevated concentrations of myo-inositol in MS plaques but not in other age-related white matter lesions may be observed and are thought to be of special interest for their differentiation.123 The regional changes in all of these metabolite levels, however, have been observed to be dynamic and variable over time in MS,124 and, as result, careful interpretation of the MR spectroscopy data is needed, depending on technical and physiologic conditions. Axial T2-weighed (TE/TR = 90/2500 msec) image of a 26-year-old woman MS patient superimposed with the MR spectroscopy volume of interest. Spectra from 2 lesions (2 and 4) and 2 contralateral NAWM regions (1 and 3) are shown on common intensity and chemical shift (ppm) scales. 1H-MR spectroscopy can detect the biochemical alteration of metabolites in NAWM adjacent to or distant from lesions in MS. The extent of NAA decrease and Cho increase in NAWM may progress over time into new lesion125,126 or lead to wallerian degeneration in certain white matter tracts.127 In a study of clinical trials, patients with treatment showed a large increase of NAA/creatine (Cr) (71%) in NAWM during the 2 years of treatment, whereas NAA/Cr decreased (8.9%) in patients without treatment.128 Taken together, NAA appears to be a sensitive marker for detecting axonal dysfunction in NAWM and is valuable in monitoring the therapeutic effects. Gray matter, especially deep gray matter in the basal ganglia, is found to be associated with the presence and severity of various neurocognitive disabilities in MS.74 Hyperintense lesions are not often seen in basal ganglia nuclei and the thalamus in MS. Conversely, abnormal hypointensities have indeed been observed on conventional T2 imaging.132 The reduced signal intensities may occur in all ferruginated neurons (Fig 8), which includes globus pallidus, putamen, caudate nucleus, substantial nigra, red nucleus, and thalamus. This is thought to be related to excessive iron deposition, which may cause injury because of oxidative stress. Using a newly developed method, magnetic field correlation (MFC), for iron quantification, one study found that MS patients had a significantly increased iron deposition in the basal ganglia, even in those cases with minimum signal intensity changes on conventional MR imaging,133 which suggests that MFC imaging is sensitive in quantitatively detecting subtle iron accumulation. Such excessive iron can cause oxidative tissue injury through the formation of free radicals and the initiation of peroxidation with potential implications for clinically observed functional impairment. The exact mechanism for excessive iron deposition in the basal ganglia, particularly in iron-rich ferruginated neurons, remains unclear, though it may be associated with the interruption of the iron transport pathway or a hypoxia-induced iron increase. Axial gradient-echo imaging in a 29-year-old patient with MS (A) and a 34-year-old healthy volunteer (B). Greater hypointense signal intensities, which may be associated with excessive iron deposition, are seen in all ferruginated neurons in a patient compared with a healthy volunteer. Relative to brain imaging, spinal imaging is more challenging because of the regional complex structures of the spine and intrinsic cord motion. Although fast spin-echo remains the preferred imaging technique, it may miss subtle lesions138 and has been shown to be less sensitive than MT-prepared gradient echo and fast STIR sequences.139 Unlike its applicability to the brain, FLAIR imaging appears unreliable in the detection of MS lesions in the spinal cord.140 In recent postmortem MR imaging studies, cord abnormalities appeared more diffuse and marked despite their minute appearance on conventional MR imaging.141 During the past several years, quantitative MR imaging techniques have been applied to the spinal cord in an attempt to improve the detection of cord lesions and quantify the severity of tissue injury in lesions and a normal-appearing spinal cord. Several studies involving DTI have shown a significantly increased MD and decreased FA in a cross-sectional area of the cervical spinal cord in patients relative to controls.142,143 DTI abnormalities in normal-appearing spinal cords are found to be more prominent in the lateral and posterior regions of the cord.143 In addition, with advanced MTI and optimized sequences, subtle cord abnormalities were also detected in established MS144; this is not the case for patients with clinical isolated syndrome by using regular MTI.145 As faster and more advanced alternative techniques emerge in the clinical setting, spinal cord imaging will become more widely used in both the diagnosis and follow-up of MS and help monitor the disease progression and therapeutic effects. High-field (≥3T) MR systems have been increasingly installed worldwide in recent years. It is important to note that continued advances in higher field strength with the leading edge technology may be applicable to both the clinical practice and the basic science research of CNS diseases including MS. One of the most obvious advantages of high-field imaging is the high signal intensity–to-noise ratio (SNR) that can be achieved. A higher SNR allows for thinner sections and higher-resolution matrices, which can improve the detection of lesions.15 The lesion counts can be 45% higher on a 4T system with better appreciation of tissue heterogeneity within lesions as compared with a 1.5T system. With higher resolution and increased contrast, high field also has the potential to detect cortical lesions, which are often obscure at conventional field strength. All of these improvements may allow for the earlier diagnosis of MS, especially in those patients who clinically are suspected to have the disease. Another notable benefit of using high-field strength is that the susceptibility (T2*) effects are boosted, which improves the examination of microscopic venous structures, brain iron, and microbleeds in the CNS diseases. The enhanced visualization of microvascularity in brain tumors has been shown at higher strength.146 In MS, the distribution of lesions usually follows a perivenous origin2; therefore, the relationship between microvascular abnormalities and lesions147 will be more appreciated at higher field. The enhanced T2* effects are also beneficial for dynamic contrast-enhanced perfusion MR imaging and functional MR imaging due to the increased resolution and conspicuity of paramagnetic contrast agents and deoxyhemoglobin. However, the susceptibility-induced signal intensity loss and distortion near the skull base and air sinuses are also prominent at higher field strengths and should be carefully considered in clinical applications. In addition, with the improved sequence and design of the RF coil, the advantages of performing MR spectroscopy at higher field strengths should also achieve increased SNR for more detailed compounds that are obscured at 1.5T.148 Thus, with the appropriate optimizations, high-field MR imaging will further strengthen the role of MR imaging in the study of MS. In the past 2 decades, MR imaging has brought about dramatic changes in the clinical evaluation of a host of neurologic disorders. The application of MR imaging to MS is a well-recognized example with regard to the impact of MR imaging on MS, including diagnosis, natural history, and therapeutic monitoring. Several new imaging terms/concepts that have been developed through the study of MS—including “lesion load,” “NAWM,” “MTR,” and “WBNAA”—are now widely used in the evaluation of many other CNS diseases. MS is a challenging disease in all aspects ranging from etiology to diagnosis and treatment. It is also a disease that has greater heterogeneity in terms of clinical forms, imaging appearance, and treatment response. With the ever-advancing technology, MR imaging will certainly further improve our understanding of the MS disease and continue to play an extremely important role going forward. Table 1 lists characteristic imaging findings of MS. Table 2 summarizes the current and future role of MR imaging in MS. This work was supported by grants R37 NS 29029-11 from the National Institutes of Health and NCRR M01 RR00096 (GCRC). Special thanks to Dr. Robert Grossman for the generous support of this work and the academic training over the years, and to Jennifer Mandell for manuscript preparation.